On the slopes of Mount Telaithrion on the island of Evia, a group of young Greeks have left the busy city and created a self-reliant rural community. Their goal is to eat only the organic produce they grow themselves, to free themselves from the national electricity grid, and to exchange what they grow or make instead of using money. The project, whose ultimate goal is to create a school for sustainable living, was the idea of four Athenians who met online back in 2008 and bonded over their dissatisfaction with the daily grind of city life. In their second year of living permanently on a forested patch of land next to the village of Aghios, 80 percent of the food they eat now comes from their two herb and vegetable gardens and the fruit they pick off the trees. The group, almost all of whom follow a strict vegetarian diet, sleep communally in yurts - portable, tent-like dwellings made of tarp often seen in Central Asia. Whatever is left over from their gardens, they exchange in the village for the supplies they cannot produce. "The crisis or the austerity measures doesn't actually affect you because you create your life and your future everyday, it has nothing to do with the outside circle. It may (have) affected us, but only in a good way because more and more people are willing to be self-sufficient and sustainable, so they contact us, and more and more people after the crisis want to get involved." 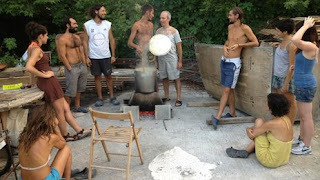 The group actively use social media, and last year over one hundred people from Greece and abroad asked about joining or collaborating in some way. Dionysis Papanikolaou, for example, gave up a lucrative academic career to be closer to nature and far from the heavy atmosphere of the financial crisis in Greece. "If you keep on reading news, watching TV and the crisis, the crisis, the crisis, even subconsciously you say the crisis! Here, there is no crisis. I mean, it makes no difference." The group take pride in being self-sufficient. "The reality of life is just outside your door. When you have to warm yourself up you actually have to go out in the wood and gather wood, fire wood, and bring it home to actually warm yourself up." They currently organize seminars on organic farming and have drawn up the plans for a large school on sustainable living to be constructed later this summer, and for which they raised money on a crowdfunding site on the internet. "I just try to be the change I want to be, instead of waiting for a government to make the change, or instead of voting for someone to make the change. I try to be the change."